If you're a tweeting twitterer, you're well aware the news actor Ben Affleck is taking over as the next Batman in the sequel to "Man of Steel" is not being received well. - His second act in Hollywood, now as an A-lister, is impressive, thanks to an Academy award win last year with "Argo." Affleck burst onto the scene with 1997's critically acclaimed "Good Will Hunting" but had not recaptured that magic until "Argo." 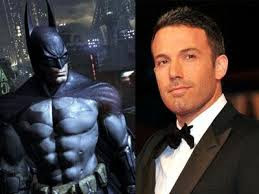 Affleck's a seasoned actor, and the timing by the studio to cast him as Batman is perfect. - A killer script is written to pull off the unprecedented superhero crossover (sorry Avengers fans. This one takes the cake). David S. Goyer is set to return to write the script and Zach Snyder to direct. I was disappointed with "Man of Steel," but I'm optimistic a solid rebound can occur because of Affleck's addition to what should be a solid cast. - The inevitable climatic fight between Batman and Superman. My hope is all involved really think this one through. A battle between the two will happen in the film, I'm convinced of that, but the best script could fall apart if Warner Bros. insists on an all-out battle royale between arguably the two most iconic superheroes of all time. Take it to the bank kryptonite, Superman's only weakness, will be introduced and that will be Batman's equalizer during the fight. Let's hope the showdown is a subtle one. A solid verbal give and take between Batman and Superman could just as impressive as a physical one. How all this unfolds will be the fun of the buildup leading into what will likely be the biggest movie summer (2015) of all time. With competition from the likes of Avengers 2, the next James Bond film and the mother of all, Star Wars 7, hitting a home run with Superman/Batman is as important as ever. Is it all resting on Affleck's cap and cowl? It might be.